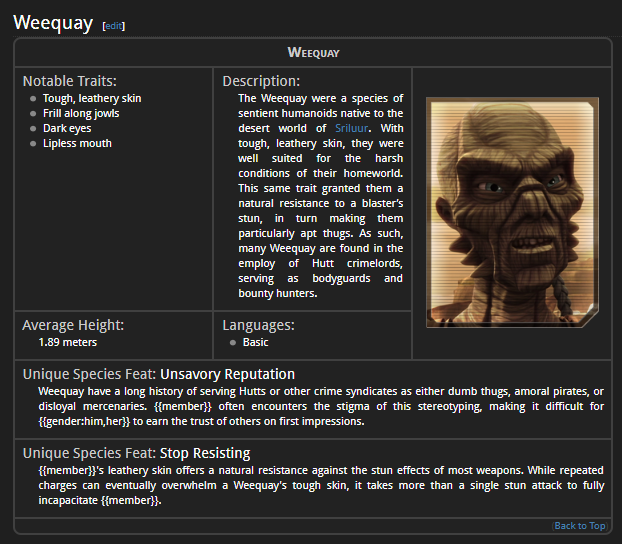 Thanks to some admin and wiki-work from TuQ, the Voice Staff is proud to introduce the addition of Weequay as a playable Species! The timing works out well, I believe, with the launch of the Shroud Syndicate. I have a few ideas for some NPCs for the DC factions already in mind, and I’ll talk more about the Shroud in a bit. Besides the addition of the Weequay, I’ve done a bit of housekeeping on the Wiki. Created by the Voice Staff, the Voice Staff Resource Hub will cover all of the relevant resources and documentation pertaining to the various fiction departments that make up the Dark Jedi Brotherhood. Here you will find links to policies, guidelines, and other information pertaining to Fictions, Run-Ons, the ACC, and the Character Sheet System. Remember this old thing? Either people have gotten tired of me referencing it, or it really has become a go-to resource for members. The hub was designed and is still intended to be a one-stop routing hub to answer any question you might have relating to the Voice office and the club's fictional systems. The biggest update here is that I’ve moved the summary of Voice Reports and Updates to its own separate page. These were a hold over from a time where we were making rapid-fire changes, and members were not looking to reports for answers and were missing vital information. I think our culture has evolved a bit since those times, which is great because Atra and I realized that we write a lot of damn reports and it's added up, I tell you! The hub now links instead to the Voice Report Repository, which will, for the time being, continue to be updated with summaries of each report and update. Working alongisde the rest of the DC, I’ve made some updates to the Voice of the Brotherhood wiki article. This mostly updates some of the bullet points of responsibility that have evolved since I took over the role. Most of these tasks are things I expect future Voices to adhere to, but I also know that things are always evolving and shifting to meet the demands of our growing organization. 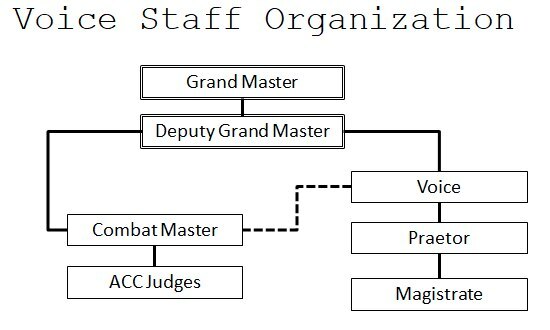 I’ve also attempted to clarify the Voice Staff relationship to the ACC Staff. This organization chart should do a good job showing it off. In short, the Voice works side by side with the CM and ACC team. But the CM is mostly reporting to the DGM and GM, not the Voice. So, technically, the judges are safe from my wrath. (Sorry Atty, TuQ, and Mauro). For anyone that has been living under a rock, the Shroud Syndicate is finally here! A compliment to its other three sister Societies — the Inquisitorius, Shadow Academy, and the Grand Master’s Royal Guard — the Shroud is an extension of the Herald's domain over the underworld, mercenary, and pirating factions that are prominent in the galaxy at large. It gives members yet another “theme” to explore with their characters. Keep in mind, even with the addition of the Shroud, there is only so much the respective Societies can provide for any given characters. It is ultimately up to you to see how you can work some/none/all of these elements into your character, or to not do so at all. Keep an open mind, and take a second to appreciate all the work that went into it. See Vyr’s newspost here, the new wiki page here, and take the exam to join here. An acronym for Arx Capital Exchange, ACE is Evant’s foray into adding some fictional flavor to the Regent role. Expect some more on this in coming updates as Evant and I play with the fictional development of the DC’s sub factions and societies! Congratulations to everyone who participated in the Legendary Encounter II competition. We had 12 entries, which is short of last year's mark, but still a pretty good turn out. I had run a poll the week prior asking what kind of event members wanted, and did expect to get a few more entries. However, it was a short timeframe, so I want to thank everyone who took the time and tried the competition out. I’ve left individual feedback on each entry as well. Congrats to the overall winners! Bubba (Dacien) is the new Justicar. Thank you, Jac, for everything, it was a privilege and honor getting to serve on the DC with you. But oh hey, Bubba. ‘Sup. Farrin is leaving me. Abandoning me. He is going to retire, or something, leaving me to suffer Howie’s abuse alone. Farrin has been an absolute, all around stud and I’ve had such a good experience working with him since my first day joining the DC. He was hugely helpful with stepping up to learn ACC grading during the War in a pinch, and helped me out with the grading of fictions. The DC will miss him. Dracy posted a supplemntal newspost that you should attend to and read. Drac is bae. Woo! Shroud Syndicate! Thanks to all who put work into the new society and the old society revamps. So much crunchy awesomeness. Great report! A fine report Wallace. A fine report. Just what I'd expect from someone of your skill set.